Add some whole grain goodness to your dessert routine with this recipe for Whole Grain Bread Pudding with Caramelized Bananas from Roman Meal. This whole grain delight is one of the yummiest healthy dessert recipes out there. Preheat oven to 350 degrees F. Grease six 8-ounce ramekins or custard cups. Place bread cubes in large bowl. Combine milk, eggs, sugar and vanilla in medium bowl and stir until blended. Pour milk mixture over bread cubes; set aside for 10 minutes. Stir in bananas. Divide evenly into prepared ramekins. Place ramekins on baking sheet. Bake 30 to 35 minutes until puffy. Remove from oven. Place on wire racks for 10 minutes. 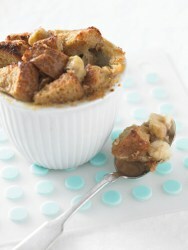 Preheat broiler to 400 degrees F. Sprinkle each bread pudding with 1 teaspoon brown sugar. Place on baking sheet and broil 2 minutes until browned; be sure to watch carefully to avoid burning. This recipe comes courtesy of Roman Meal. As one of the first companies to come out with a whole grain bread, Roman Meal is a brand that you can trust to deliver whole grain goodness to your family. All Roman Meal breads contain whole grains. They also have a natural balance of good fats (mono- and poly-unsaturated) and good (complex) carbohydrates. Complex carbohydrates are a good weight management tool because they take longer to digest, so you feel full for a longer period of time.